We are SO proud to announce that Shannon's NEW Craftsy crochet class is LIVE! Crochet Toolkit - Designer Tips & Tricks is Shannon's third Craftsy crochet class and we can't wait for you all to dig into this material. These are the skills and techniques we use in the Shibaguyz Designz studio every day to create our FAB garments, accessories, and home decor. From how to read crochet charts, to some of our easy math tricks for making sure patterns fit, to making FAB crochet fabrics; you'll get a designer's insight on how to take your crochet skills from good to GREAT! This class includes our designer tips for how to make linked stitches, 6 types of ribbing, how to create crochet fabrics that drape and move beautifully, and how to make our very own Non-Stick Lace stitch. 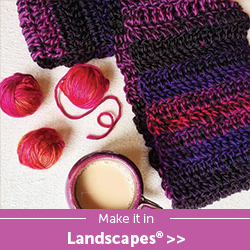 We'll also get into how to invisibly carry your yarn up the side of your work with changing colors or working with hand-dyed or variegated yarn. And, for the first time, we're going to share with you how we make crochet i-cords and Romanian cords AND how to make them as attached as-you-go borders! Y'all are NOT going to want to miss this class! So don't wait! Click on our special link below to get $10 off the price of enrollment and get started on your new crochet skills today!